The morning after the night before, I awoke afresh after having slept off the previous night’s dinner decadence at La Famiglia with a renewed sense of anticipation for the lunch to come. Still more sleep couldn’t hurt, and the hour ride to our destination with designated driver in tow would allow me some catch-up snooze time before our feast. As mentioned in Part 1, Sunday lunch was at The French Horn, a classic French restaurant in Sonning, famed far and wide for their spit-roast duck. The restaurant has the look of a classic French manor. 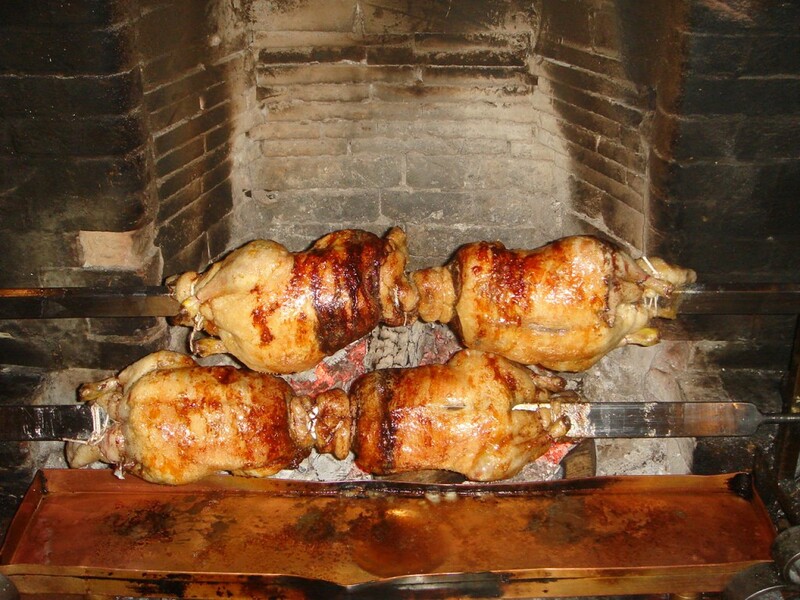 French period furnishings dot the drawing room where, as we entered, four ducks were being roasted on a rotisserie in plain view at the fireplace. With aperitifs to start, we perched ourselves by the fireplace. Not only was it warming for the soul on this damp autumn afternoon, it was also a mouth-watering way to pre-empt our lunch, watching the act of cooking before the actual act of eating itself. With the ducks glistening as they turned on the rotisserie, it was a truly a feast for the eyes. 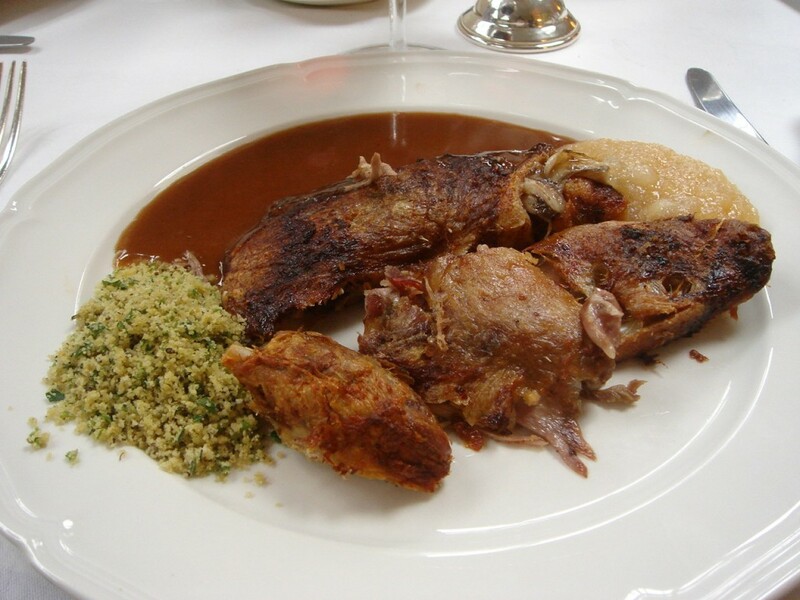 As menus were placed before us whilst we sat in the drawing room, we all decisively and unanimously chose its famed duck, although the choices of Contrefilet de Boeuf Roti (prime roast ribs of Aberdeen Angus Beef) and Cabillaud Viennoise (cod gratin style) also sounded delectable. Make no mistake – this was not a place for vegetarians. There were no vegetarian mains and there was only asparagus on the starter list to satisfy a vegetarian palate. With our food choices made, we also settled on a wine, from a list which obviously had a French focus, and was neatly classified with tabs into white and red Burgundys and Bordeauxs, magnums and New World wines. Pricing started at about the £40 mark, although there were also those bottles priced for the bottomless wallets at thousands of pounds, including a £4,000 1953 Chateau Lafite Rothschild. The dining room was divided into three areas: a long room, a semi-circular room, and a separate area for private dining. Windows lined the walls which, in keeping with the French manor theme, had been dressed in rich, floral-patterned curtains. From almost every table in the restaurant, it was almost possible to peer through the windows to obtain a scenic view of the lush green gardens backing onto the Thames River… almost, unless you were unfortunate enough to sit with your back to the window. 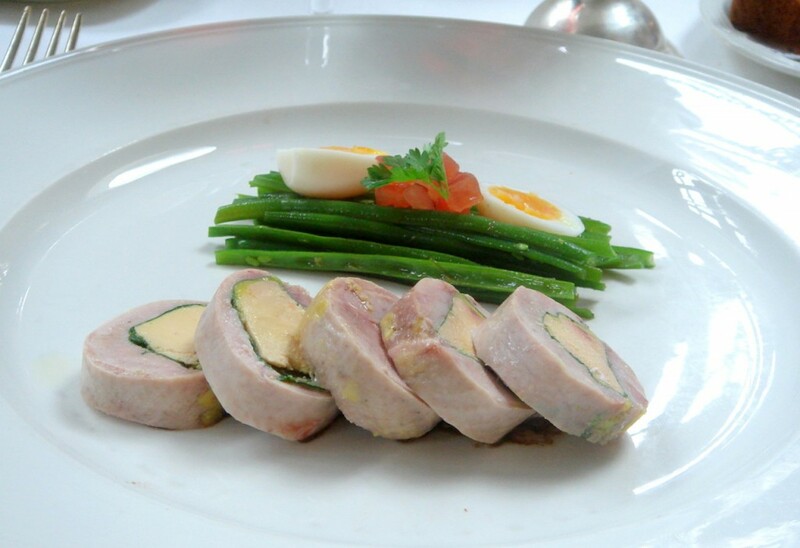 The service was prompt with our starters of quail stuffed with foie gras and foie gras terrine appearing quickly. The quail, served cold, was a roll of thick pieces of quail meat filled with foie gras, sliced, and then finished with the slightest of truffle vinaigrettes. 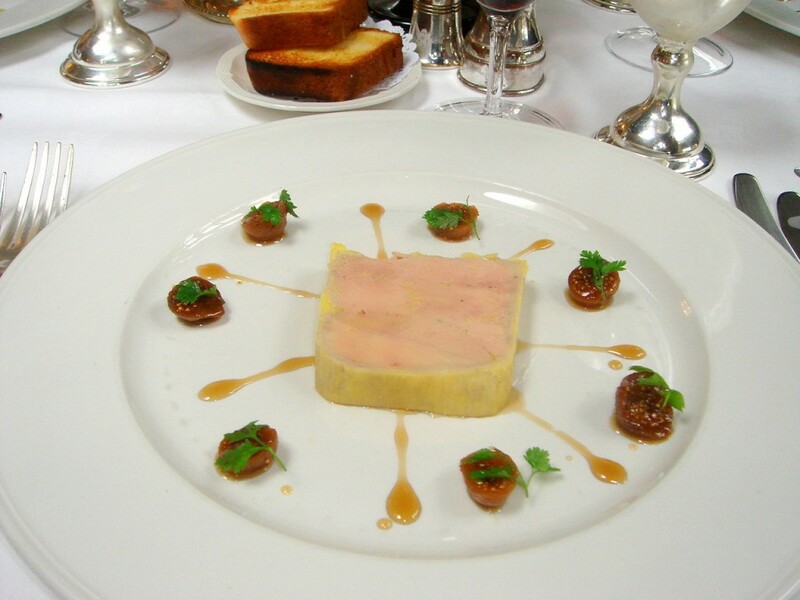 It was delicious, with the luscious delicacy of the foie gras contrasting with the gamey meatiness of the quail. The terrine was rich and creamy, and served with the most perfectly toasted of soft brioches. Next was the pièce de résistance, but somehow the ducks being presented whole to the table before carving didn’t appear quite as delectable as the display ducks which we had seen roasting in the drawing room. Lacking a glistening sheen, up close they appeared quite dry. Each serving was half of a whole duck, deboned and presented with apple puree, seasoning and duck juice (which tasted more of gravy than jus). Although flavourful and gamey, as it turned out, the duck much needed the puree and duck juice for it was in fact quite dry, almost attaining that breakaway texture that you get with duck confit but without any of the moisture. I suspect that this was probably due to the duck being pre-cooked early in anticipation of the lunch time crowd and left to sit till we finally arrived at the restaurant at 1.30pm which caused it to dry out. An earlier lunchtime sitting might have possibly salvaged the situation. Accompanied with sides of pommes dauphinoise and spinach, the meal proved rich and filling. But with a fixed-price menu of £48.50 for three courses, it would have been unjust to skip dessert. 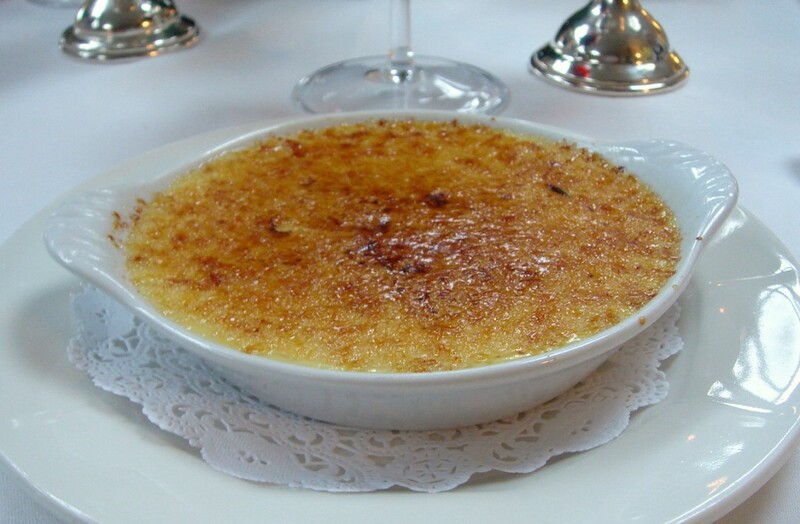 So I forced down a crème brulee which was a wonderful rendition of this French classic. It was creamy and perfectly crunchy and crispy on top. Like at La Famiglia, The French Horn catered to another well-heeled, if slightly older crowd. On this afternoon, it was the epiphany of a classic Sunday lunch in the country for the gentry. The men were dressed in their Sunday best and the women in Chanel or the like. The waiters were in black and white; formal and stiff, but not unpleasant. It was a lovely setting for Sunday lunch, an epitome of refinement. It’s probably one of the best that Berkshire has to offer, but when you consider the one hour drive from London, I’m wasn’t sure that dry duck at these prices was entirely worth it. Feeling rather rotund, I was wishing that I could head upstairs to one of the 21 rooms in the hotel to sleep off my weekend of gourmandising. Unfortunately that was not to be the case. Oh well. Dozing off in the back of the car for the drive home would just have to do. Just as well someone else was driving. As I awoke about an hour later, travelling on the A40, I peered out the window to see the dazzling sign of the new Westfield shopping centre flash before my eyes. Almost home. Nice. Price – £48.50 for three courses. Excludes drinks and service. Thank you for the lovely comment. I hope you will continue to read my blog.